“Humiliated, beaten, insulted, and threatened — for what? — for things so trivial that they defy logic; demands for supplements, injections, or drugs that patients are not in need of,” Yazan exclaimed. Patients, as he explained, seek to impress their authority on doctors, and if that fails, they flaunt their phones threatening to end their life with a single call to powerful militias. This reversal of roles has played out for several years now, sustained by an underworld of militia gangs and tribal networks that are armed and well connected and lamentably respected, in the absence of a functioning state. “We can’t work miracles, we don’t have supernatural powers, nor are we here to be ordered as servants by patients and hypochondriacs,” Yazan defended wryly. “The worst instances are when corpses are brought in, accompanied by a chorus of relatives screaming: ‘Doctor, help, he’s not breathing, or his temperature is cold, or, he’s not moving.’ We cannot announce their death on arrival, out of fear of being attacked, so we put on a performance for the families so they can witness with their own eyes us trying to resuscitate and use everything else within our means to save the patient, even though they’re already dead,” added Yazen. Operating on a financial shoestring, hospital staff are left picking up the pieces of their country’s faltering hospitals and clinics. They are vilified, scapegoated and abused by displeased patients and their families. 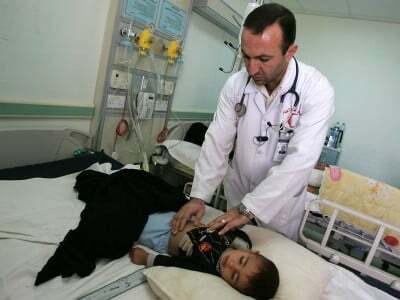 A little less than a decade ago the Iraqi cabinet passed a bill purposely intended to remedy the problem by offering physicians legal protection. But, like all other political initiatives in the country, this has failed. Medical working environments are becoming increasingly dangerous as more bullet-riddled bodies are discovered. With nowhere to turn or to lodge complaints, a sense of despair is settling among physicians, many of whom fear any one of them could be next to die at the hands of angry mobs.